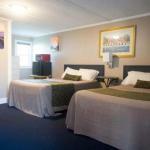 Featuring an outdoor swimming pool Sea Turn Motel is a family-owned property located in York. Free WiFi access is available. A private or shared balcony is included with each guest room. A microwave refrigerator and flat-screen cable TV are also provided. The York Sea Turn Motel offers free parking. Nubble Light and Sohier Park are just 3 minutesâ?? drive from the motel. York's Wild Kingdom amusement park and zoo is 2 minutesâ?? drive.